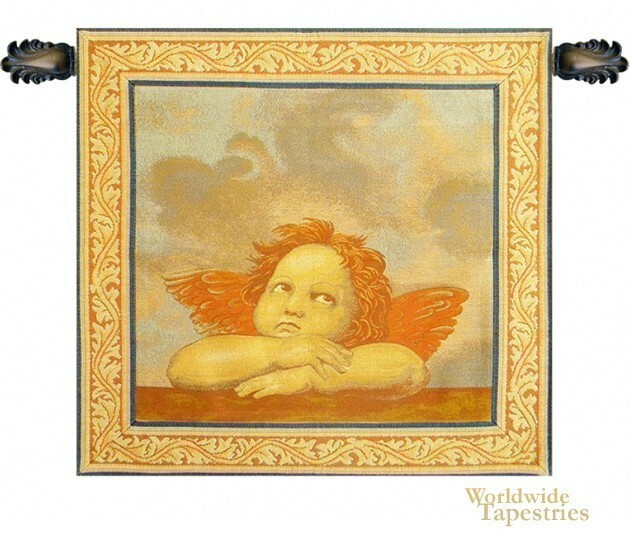 Angels (Right Panel) - Raphael tapestry shows the second cherub from the Sistine Madonna originally painted by Raphael (1483 - 1520). This iconic piece of Renaissance art was part of altarpiece for San Sisto in Piacenza. Here we see a childlike cherub gazing towards the heavens. This era of Renaissance art by artists such as Da Vinci, Michelangelo, Raphael and others were the source of much well known art to this day. This Renaissance tapestry is backed with a lining and a tunnel for easy hanging. Note: tapestry rods and tassels, where pictured, are not included in the price. Dimensions: W 17" x H 18"
Dimensions: W 21" x H 22"